Sunlight provides by far the largest of all carbon-neutral energy sources. More energy from sunlight strikes the Earth in one hour (4.3 × 1020J) than all the energy consumed on the planet in a year (4.1 × 1020J). In nature, Photosynthesis accomplishes the task of light harvesting and its conversion into chemical energy. This process is extremely complex and requires interplay of many proteins and protein complexes. 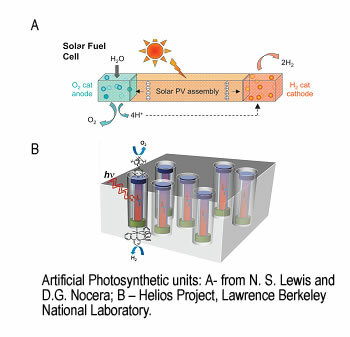 The direct conversion of visible light to chemical energy (fuel) by a synthetic device made of inorganic, organic or hybrid materials is an attractive method for harvesting sunlight in the form of fuel. Different conceptual schemes have been proposed in which sunlight is used to drive the flow of electrons and protons. Coupling the electrons and protons to catalysts breaks the bonds of water and makes the bonds of H2 and O2 to effect solar fuel production. This process requires efficient and robust water oxidation catalysts that can be incorporated into a molecular assembly or other microscopic structures or immobilized on an electrode surface. We apply spectroscopic techniques to study biological and synthetic systems capable of converting visible light into chemically stored energy. Insight into mechanisms of their functions will help to create new, robust and efficient light-to-energy conversion units. Very recently, the importance of heavier metals, such as Fe, Cu, Mn, Zn, (0.1-0.5 mM concentrations in gray matter) for brain function was recognized. The brain utilizes these metal ions in many biochemical processes, including signalling (Cu and Zn). Abnormalities arise by two mechanisms: i) metal ion-mediated protein aggregation, ii) metal-catalyzed oxidative reactions. Proteins with redox-active metal ions have highly structured and selective active sites which prevent inappropriate electron transfer. Redox-active metals are chaperoned in the cell to prevent oxidative side reactions. It is common for neurodegenerative diseases that the binding of metal ions in the brain is highly affected. Pathological formations with increased metal concentrations were observed in brain tissues of patients with Alzheimer’s and Parkinson’s diseases. We use high resolution (micro to nano) X-ray imaging for simultaneous detection of metals (such as Fe, Cu, Mn, Zn) in neuron cell cultures and brain tissues. 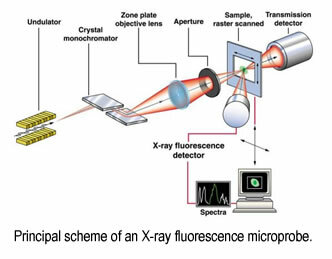 Subsequent collection of XAS spectra from selected areas on a sample will provide information about the redox state and ligation of the metals. There are several advantages of the proposed technique: i) it does not require staining, thus samples are unaltered prior to analysis ii) it detects all metal ions, as compared with fluorescent probes whose limited affinities result in primarily "free" ion detection; iii) it probes the redox state and the coordination environment of the metal; iv) if applied in parallel with conventional microscopy, it identifies the location of areas with increased metal concentration with respect to the tissue structure. This will result in detailed structural and functional information on metal-binding sites in normal (functional) and abnormal metalloprotein assemblies relevant for brain function. Information about the function of metals in the brain and their involvement in the development of neurodegenerative diseases will aid in the design of therapies. Highly motivated students are welcome to contact me about research opportunities.